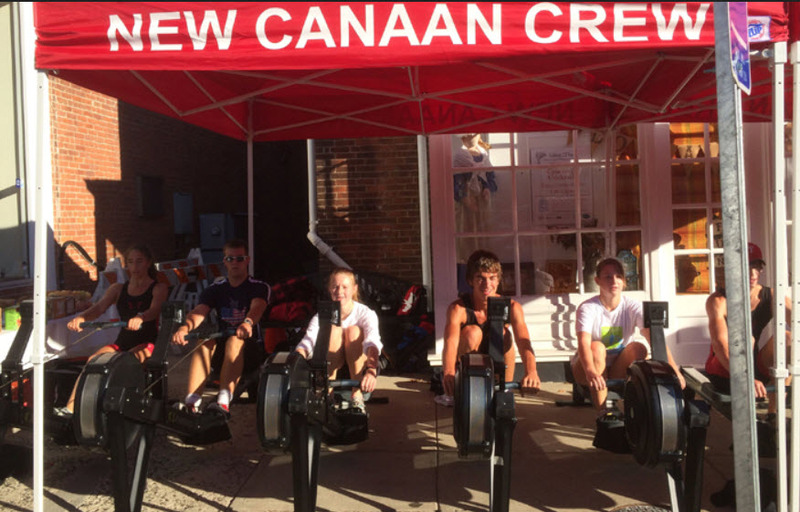 Come out on Sat, Sept 29th from 8 - 11 am to watch as New Canaan Crew hosts their annual “Erg-a-Thon” rowing exhibition. Held on Elm Street in downtown New Canaan, the event will feature a demonstration on the use of the "erg" (a machine equipped with a sliding seat, designed to simulate rowing). and other opportunities to learn more about rowing. All of the New Canaan Crew rowers will be on hand for the event, designed to raise funds and seek sponsorships to purchase new equipment for the program. You will also see teammates strolling downtown New Canaan to collect donations to support the effort. As a club sport, the program is self-funded and not eligible for booster funding. The “shells" (boats) and the various equipment required to maintain a crew team are very expensive. The team is grateful to the New Canaan community for it's support in years past and hopes it can continue. The MRC/NC Crew Uncle that donates the most will get a 'NC Crew" t-shirt, a seat of honor at the end of fall banquet and a framed "NC Crew Uncle of the Year" certificate to solidify that they are indeed the most awesome MRC.NC Crew Uncle! Currently, donations may be made only by check. Yes, we are working feverishly to get an online means of donating that doesn’t cost us a fortune and we will let you know if it becomes available. Please replace any cash that you collect with a personal check made out to New Canaan Crew. Fill out your sponsor form (attached here) making sure to include the email addresses of any donors who give $100+ so that our treasurer can email them a tax exempt letter. Be sure and make a special note of any “Uncle Challenge” donations. (We recommend making a copy or simply taking a snapshot to keep as the forms will not be returned.) Place your sponsor form and checks into your own envelope (any size) and be sure to write the rowers name and team (Var, JV, Mid Sch, etc) on the outside. A collection box will be available at both the boathouse and the tanks locations beginning this Tuesday the 25th. We would love all money to come in by event day but we are realistic and low stress gals. The collection boxes will remain at practice to collect for a few days after the event. The only exception is the “Uncle Challenge.” In order to name a winner, that money needs to be in by noon on event day to our treasurer, Keith Whittaker or Amy Plum. New Canaan High School Crew, Inc. is a 501(c)(3) Public Charity. Tax ID#22-3795003 As a club sport, we are self-funded and not eligible for booster funding. All donations are tax deductible and any amount over $100 will receive a tax letter. Many companies offer matching gift programs encouraging employees to contribute to charitable organizations. Most of these programs match contributions dollar for dollar, and some will even double or triple the amount of your gift! Please check with your company to see if it offers a matching gift program that will match your gift to New Canaan High School Crew, Inc.. Some companies have you fill out their paper form and some now have online submissions. Please contact Amy Plum if there is anything additional that we may do to assist you. Our treasurer, Keith Whittaker, will email out a tax exemption letter to those who donated over $100. Make sure their email address in on the form.